If someone had told Ngaire we had to get up at 5am this morning, maybe she would not have had that last beer last night. As it is, she is full of smiles and happiness this morning. We are all extremy excited to be ableto goet up at this God unholy hour when we are on a HOLIDAY. 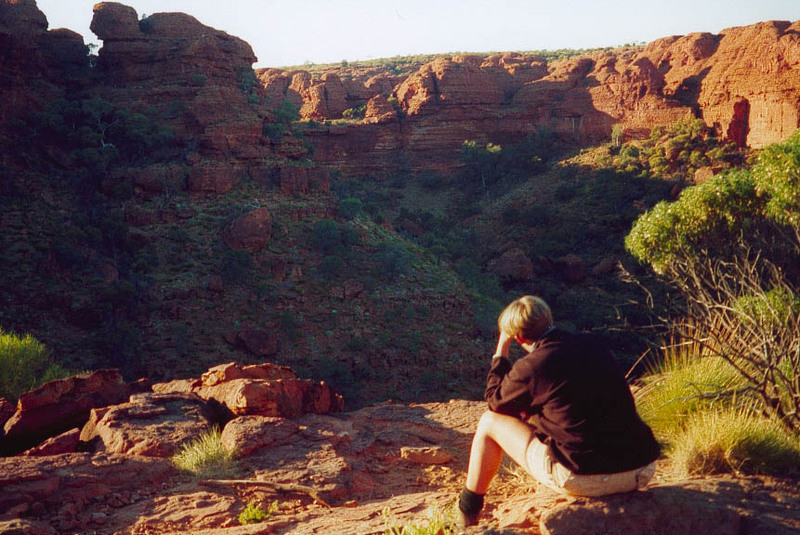 Lachy wants us to be early at Kings Canyon to avoid tourists. That is a fair enough reason I suppose so we all get ready as fast as we can (not very fast mind you). We arrive at the Canyon at about 7am and set out for a 4 hour walk. And it is shocking .We are all in shock when at 9 o' clock, someone says: God, it is 9am and we have been walking for 2 hours already!! The view is beautiful and Lachy sends us out to find some Aboriginal paintings. What we find are kid's handprints. Nothing much but Lachy is excited. The Canyon itself is bloody high and scary. After about 2.15 hours, we reach the Garden of Eden, a waterhole in the middle of the canyon. We were supposed to go swimming but the water is absolutely freezing. Instead we have some food there. Lee throws me an apple and I miss. It drops in the water and with joint effort I get it out again after 30 mins. It requires some rockclimbing so Ngaire tell the group to get their cameras ready because I am about to fall in. No way. After the long walk, we have toasted sandwiches on the BBQ. Beautiful Australian thing: BBQs are everywhere where you can park a car. Lachy tries to work out how much money we all owe him for beer and cider but funnily enough, nobody seems to know exactly how much they had to drink the previous nights. In the afternoon we drive into the Western McDonnell Ranges. After the Red Centre it looks rather bland to me, not really spectacular. God how blase can one become after 9 days in the 'bush'? Spectacular however is the place where we spend the night. Glen Helen Beach. we go for a refreshing (read: bloody freezing) swim. After that we make dinner and because it is Ngaire's and my birthday soon, we have chocolate cake and candles. I am touched by it.we spend the rest of the night dancing and boogie-ing to some terrible disco music. We are all abit sad about this being our last night. I think i can speak for all of us when I say that no-one really wants the trip to end.